BizInt Smart Charts for Patents builds charts from search results on the STNext platform. As of Summer 2018, exports from STNext are treated as classic STN transcipts, as you would create using STN Express. All files supported on classic STN are supported via STNext. This includes support for the HITSTR display format in CAplus. The preferred export format for STNext is RTF. Please note that images and chemical structures will only be preserved in the RTF format. Do not edit the exported RTF file in Microsoft Word before importing into BizInt Smart Charts for Patents. Note: Ensure that the Classic Display option is ON in your STNext settings before displaying results. When you have completed your search and are ready to display results, you should start a new transcript. To do this, move your mouse near the transcript name and hit the Start New button. Enter a name for the new transcript, and then execute your display commands. When your display has finished, press the download button. 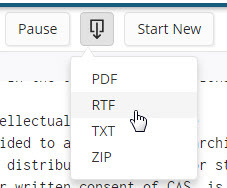 Select the RTF format from the list. The transcript will be saved to your computer. You may import the file into BizInt Smart Charts for Patents, or drag the file into the software if it is already running.